Lulu: Do you have an origami petpet yet? If you don’t, you probably haven’t read our previous article yet, or you’d definitely have acquired one by now! Well then, I assume that you’re a new owner of a cardboard petpet, or possibly a first time petpet caretaker in general? Perhaps you've just realized you had a Liobits sitting in your Safety Deposit Box. Maile: Well, whatever the reason may be, we've decided to write up ten things you should never do with a cardboard petpet. Please abide by these ten things to avoid any mishaps! 1. Eep! Watch where you sit! After a long day of playing games and shopping in Neopia Central, Neopets just want to sit back, relax and maybe watch a spot of Neovision. Be careful, though, and make sure you look into the corners of your Rainbow Couch! All too many origami petpets have been innocently ruined by an accidental sit-upon. When you're moving furniture around in your Neohome, check that your Ditsy isn't hiding under table legs; you don't want her to get squished! Kadoaties and cardboard petpets just don’t mix. Well, Kadoaties rarely mix with anything, but that’s beside the point. If you leave your Liobits alone with a Kadoatie, it’ll probably be mistaken for a Cardboard Scratching Board! Ouch. You might want to keep this in mind when you pay a visit to the Kadoatery – don’t let those reinforced steel bars lull you into a false sense of security. Even though Froglers may closely resemble Greebles, they aren’t even distantly related. Froglers can’t swim – at all. Water will destroy their papery bodies. While you're swimming at the Rock Pool, you should let your cardboard petpet nap on the nearby Mystery Island Beaches. Maybe you could ask a friend to babysit him while you go for a dive in Kiko Lake or even when fishing in Maraqua’s famed underwater caverns. Even though your Weeble may not say much, she can still understand what you're saying! So please, be careful when talking about her to your Neofriends, you don't want to hurt her feelings. Origami petpets are very sensitive. The next time you're chatting with a friend, remember to only say positive things about them. Also, take into consideration that cardboard petpets have cardboard hearts, which tear very easily. 5. Oh where, oh where has my little petpet gone? Please don't feed your origami petpet. It may seem cruel, but they don't have to eat (although they aren’t above stealing a bite or two from your Inventory every now and then)! Besides, it would make your petpet very dirty, and cardboard petpets can’t exactly be cleaned with soap and water. Can you imagine trying to clean Marshmallow Yam Soup off your Frogler? It would become such a sticky, soggy mess! Yuck. As we said in our last article, Froglers, Liobits, and Weebles are all very useful to write on, especially when a brilliant Neopian Times idea comes to you while walking around Neopia Central. However, remember to never use a sharp quill when writing on your petpet. The pointy tip may damage your petpet and hurt him very much. Consider carrying a Box of Crayons around with you in your Explorer Backpack instead; they are much softer and safer to use when you write with them. 8. Cardboard... I can has it? *puts on serious hat* We cannot stress this one enough. Never EVER put your cardboard petpet anywhere near a Grarrl or a Skeith. What if the pet grabs the petpet and devours it? The Neopets Team has warned us all about how Grarrls and Skeiths can magically grab something out of your inventory and eat it! This rule goes for all petpets, but is especially true when dealing with your precious cardboard ones. Ooh, what a windy day! But where has your petpet gone? Since origami petpets are so very light, they can blow away really easily! Then your petpet will land in an unknown place and be lost forever. That’s why it’s important to keep an eye on your petpet during those windy days. Can you imagine your poor Ditsy wandering around, all alone, not knowing where he is? Just thinking about such tragedies should make tears well up in one’s eyes. 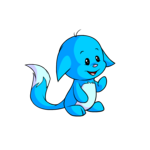 You must be very careful when matching your cardboard petpet with a pet, and think wisely when choosing a petpetpet to go with it. For example, you shouldn't pair your Fire Blumaroo with your cardboard Frogler. That would be extremely dangerous for your petpet, because paper catches fire easily. Exercise similar caution when selecting a petpetpet. A Pinchit wouldn't be a good match with a Ditsy – those sharp claws could very easily tear and harm her. Maile: So there you have it, the ultimate guide of what you should never do with your cardboard petpet! We really hope you had as much fun reading this article as we had writing it! Lulu: ...Maile, you still have the serious hat on. Disclaimer: The writers claim no responsibility for temporary insanity secondary to paranoia induced by reading this article. Any spontaneous implosion on the part of the reader is solely the responsibility of the reader... wait, what?